I'm going to let you in on a secret: I love grocery shopping. 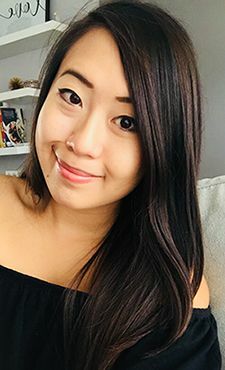 Groceries are a weekly task for my boyfriend and me, which means we get to spend time together picking up the food we plan on cooking together for the week. With both of us having graduated just under a year ago, we are working hard on saving money to buy our first home. I spend a portion of time each week flipping through flyers delivered to my house, searching for deals so that we can save just a bit more money here and there to get a bit closer to our dream home. But why spend time flipping through pages when you can get everything in one place? 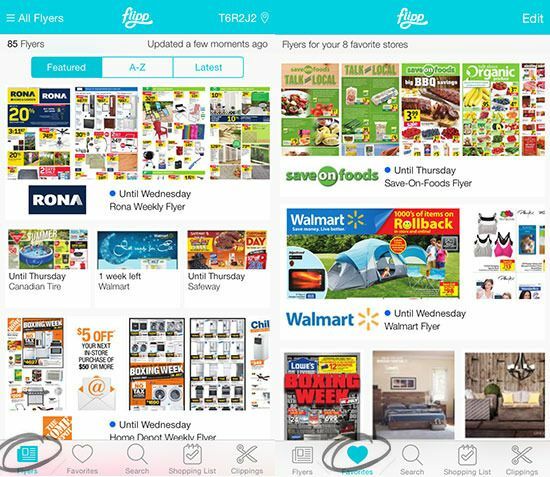 Meet Flipp, a free app for Apple and Android that brings together weekly circulars to help you save time and money on your purchases of groceries and household items. I was invited to take the #FlippFoodChallenge to see how much money and time I could save just by using the app. All I can say is, where has Flipp been all my life? After I entered my postal code, flyers for nearby stores popped up. There was also the option of adding stores that I frequent into a favourites list to cater the list of flyers to my needs. After that, it was time to browse. When you search through a flyer for a specific store, the dates that the prices are advertised for appear at the top. 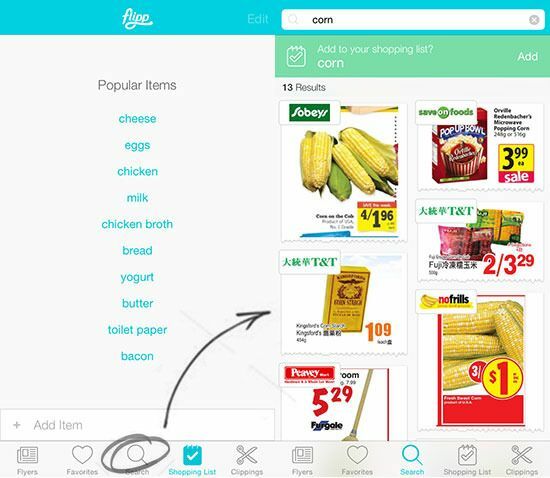 With the tap of a finger you can choose what items to add to your shopping list, and those items are transferred into the 'clippings' section of the app. All your clippings are listed alphabetically by store, making it easy to compare prices and ensure that you purchase all your items when using the app in store. I liked this function of the app the most, because it made sure that I wasn't wasting my time browsing around the store unnecessarily, and I didn't miss a thing on my shopping list. If certain offers expire before others, they're clearly marked. Another great feature in the app is the Shopping List, where you can enter a list of all the items you need for the week. There are suggested popular items you can pick from, and all the weekly deals for the items pop up for you to browse through to find the best value. If you're looking for a specific item, you can enter it into the search bar and all deals for that item pop up too. It's so handy if you don't want to comb through the circulars! 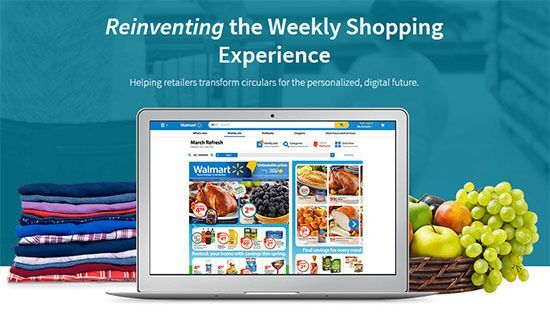 Using Flipp really did save me time and money for grocery shopping last week. With the user-friendly interface it was a breeze looking for certain items, I spent less time in the grocery store and definitely saved some money along the way by comparing prices with ease. We were able to save anywhere between $1-$3 on each of the items we needed for the week just by using the app. Of course there is definitely the trade-off of time used driving from one store to the next to get the best price on certain produce, but most of my grocery stores are within minutes of one another. Time can also be saved as some stores offer price matching, and you can do it directly from your mobile device. 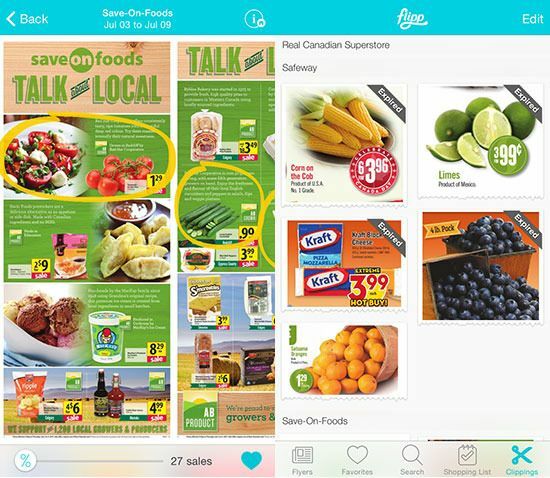 Using Flipp is also better for the environment, as you can eliminate the printing and delivery of circulars to your home and shopping lists don't have to be written down on paper. I thoroughly enjoyed using Flipp, and now I have my mother hooked on it too. The money saved will definitely contribute to my dream home fund and maybe pay for some date nights along the way. I'll definitely continue to use the app, and I encourage you to try it out too! *Disclosure: I received compensation for the #FlippFoodChallenge and to write this blog post. Views expressed in this post are solely mine. This post is 100% my opinion, and as always, my priority is to you, the reader, to present an unbiased, thorough review. Me too, I don't mind grocery shopping! I'm definitely checking this app out. How are you doing Andrea? Any plans this summer? Pizza & Pop: Urbano Pizza Co.